In medieval times, the only way to maintain security on the open flatlands of Russia was to construct walled citadels and strongholds in strategic locations. Not only did these fortresses, or kremlins, serve to repel enemy invaders, but they also became trading and religious centers. Since ancient times, Russians have been known for their fortress-building skills. As there were no natural barriers of mountains around the Russian plain, its inhabitants had to seek protection from a hostile world behind high walls. A Russian city was not merely a concentration of houses as in some European countries. It was always a fortress as well, which yielded the word gorod or city, originally meaning ‘fenced plot of land’. Medieval Scandinavian travelers were so impressed with the abundance of fortified cities in Russia that they called it Gardariki, ‘the country of castles’. Before the Mongol invasion in the 13th century more than 400 fortresses, or kremlins were built in Russia, the word coming from krepkiy, meaning strong. Most were earth ramparts topped with wooden walls up to six meters thick, from where dozens of bowmen could fire down on attackers. The log towers held catapults, and further fortifications included ring moats with wooden spikes hammered into the bed to prevent the enemy crossing. A fence or palisade then stood between the moat and the wall. The largest cities, Kiev and Vladimir, had stone gatehouses, usually crowned with a tiny church, which as well as having symbolic meaning had the function of a watchtower. The key fortresses had stone walls. In the 9th century, stone fortifications surrounded Izborsk and Staraya Ladoga, cities on the country’s north-western borders that were constantly under attack. Mightiest of all was the Pskov kremlin (Krom), which after an attack by the Crusaders was the first fortress in Russia to be stonewalled, its perimeter built on a foundation of huge boulders. However, most fortresses were made ​​of wood and were burned down by the Mongols in the mid-13th century. The next generation of fortresses, built in the 14th century, were stone-built, the first of them being the Moscow Kremlin, built of white stone in 1360. Its construction was national in the fullest sense of the word. Masons from all over Russia came here to fashion blocks from the white stone quarries opened near Moscow especially for the task. Walls rising to a height of six meters encircled an area of ​​10 hectares that contained the whole city, from its princely towers and churches to workshops, warehouses and the homes of ordinary people. The fortress had six gates and ten watchtowers controlled a wide strip of surrounding territory. A well was dug in the basement of one tower to ensure water during a prolonged siege. The might of the new walls was tested by invaders a year after their completion. In 1370, the army of the Lithuanian Grand Duke Algirdas tried to storm the city for eight days but retreated after suffering huge losses. In 1382, Tatars then rushed the white-stone Kremlin, also bringing to bear the newest battlefield innovation, the cannon. But the nomads failed to take the fortress and were about to retreat until traitors persuaded the Muscovites to open the gate. The Kremlin fell and was completely burned, but was fully restored within a few years. In the 15th century it withstood two long sieges but had begun to deteriorate by the end of the century. In 1485, by order of Grand Prince of Moscow Ivan III, work began to build a system of new red brick walls on the site of the former white stone walls. Construction was supervised by the finest military architects in Europe - the Italians. Their creation incorporated architectural techniques in wide use by European specialists. The swallow-tailed crenellations of the Kremlin battlements were the same as those of the Doge’s Palace in Venice, and the toothy contours of the towers and walls are reminiscent of Scaliger Castle by Lake Garda and the Sforzesco Castle in Milan. The Kremlin also significantly increased its territory, and the number of towers rose to 20, making the fortress of the Russian princes the largest in Europe at the time. Meanwhile, stone fortresses were erected on the south-eastern and north-western borders, where Russia was under constant threat. Kremlins in Tula, Kolomna and Nizhny Novgorod covered the center of the country from Tatar incursions, while the Oreshek and Ivangorod fortresses near the Baltic placed a formidable obstacle in the way of the Swedes, the Danes and Germans. More fortifications were built through the 16th century, including two additional defensive stone belts and a circular earthwork around the Moscow Kremlin. 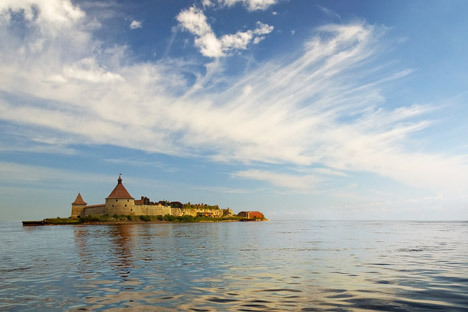 In 1595-1602, the Smolensk fortress rose on the banks of the upper Dnieper River, and was soon dubbed the “necklace of the Russian land” by the locals. Its walls stretched 4.7 miles, three times the length of Moscow’s walls, and its perimeter was guarded by 39 towers. Its uniqueness also lay in its three rather than two defensive levels, rendering each tower and section of the wall a miniature fortress in itself. The walls were so broad that three horses could comfortably ride down it, yet the construction was artistic as well as functional. Every loophole was clad with architraves, like decorative house windows. In 1609-1611, Smolensk withstood a long siege by Polish forces but the invaders could not capture the city in an even fight. By the end of the second year of the siege, however, almost all of the defenders had been killed and the Poles instead broke through an unprotected section of the wall. The 16th century was the golden age of monumental Russian military architecture, which receded into the past in the next hundred years with the advent of artillery. Instead of grand kremlins, planners threw up defensive lines consisting of small fortress chains. In the 18th century, thick walls finally gave way to bastions connected with squat ravelins - triangular detached fortifications set away from the fortress buildings, designed to break up attacking forces and expose them to firing positions above. However, the fearsome fortifications of the ancient Russian architects still bear witness to the great wars of the past. One of these, the Kolomna kremlin, last year was even accorded the status of symbol of Russia. Alexander Vershinin is an historian and holds a Ph.D in History. He is a senior researcher at the Governance and Problem Analysis Center in Moscow.